Babydam > BabyDam > Until What Age Can I Use A BabyDam With My Child? 10 years on we still get A LOT of buying questions about the BabyDam, and each one adds value and helps us to educate our customers about the innovative BabyDam. In this time we’ve been able to build up a strong FAQ section on our website that customers can head to, and if you can’t find an answer to your question then you can contact us at any time and we’ll be delighted to help. This week we started sharing a frequently asked question on our social media to help educate our followers about BabyDam. This has spurred us on to delve into a frequently asked question on our blog each month to provide more of an overview around BabyDam, but also around the topic as a whole. We want our customers to have everything they need at their disposal and we want to make the buying process as easy as possible. So, let’s kick this month’s FAQ off with one we get asked a lot, and by all ages, even adults. The simple answer here is that there is NO right answer! Helpful, I know. But it’s true! If we had a pound for every time a customer contacted us and said ‘I wish we knew about this before and didn’t bother buying a baby bath’ then we’d probably be millionaires. The misconception is that every baby needs a baby bath. Thus a BabyDam is only considered when their baby has outgrown the baby bath and is looking to make the transition to a family bath. BabyDam can be used from the outset with newborn babies. How? Simply section off a much smaller area away from the taps and fill it with water to just above the newborn baby’s shoulders to keep them warm. If you remove the safety porthole (plug) from the BabyDam this will prevent you from overfilling the bath. With a newborn you can either support them with both hands in the bath when washing or use a baby bath cradle in the area for them which will help to free up your hands slightly. It may make baby feel a little more comfortable too. At this young age you don’t want to be bathing baby for longer than 10 minutes anyway as they get cold very quickly. 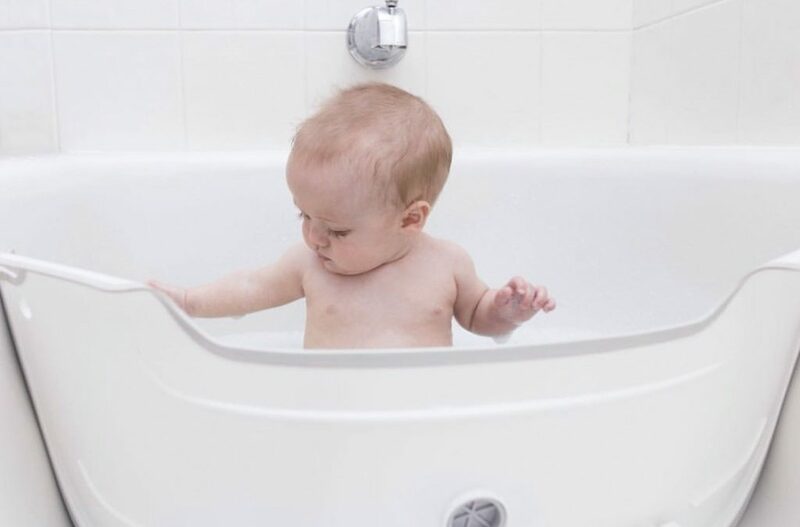 A traditional baby bath has a lifespan of about 0-4/6 months, as they begin to sit up and when baby gets bigger it renders the bath useless and it’s time to move them to the family bath. Based on this, our common user of the BabyDam is between 4 months-3 years. However, this is totally down to your baby’s development, confidence in the water and their size. Just like parenting as a whole, there is no right or wrong way to do it. Just do what is best for your baby. Many children find that BabyDam becomes synonymous with them at bath time, providing safety and comfort in their own cosy area within the bath. The uniqueness of BabyDam is that it grows with baby, as baby’s size increases you can position BabyDam further back in the bath providing them with the additional space that they need. We have experience with children using BabyDam up to the age of 7, leaving a small area dry to store their bath toys. We also get asked whether adults can use BabyDam if they have a longer than standard bath size. We experienced this a lot last year during the water drought in South Africa as adults were trying to find ways to continue bathing regularly whilst not using a hideous amount of water. It also depends on your bath size. If you have something like an L shaped bath, then you could continue using this even for adults! As once sectioned off with BabyDam it provides you with potentially 2 sections for bathing which are both averagely sized. There is no one size fits all answer, you can continue using BabyDam as to when you feel appropriate for your baby. If they’re feeling more confident in the water and you feel they would benefit from a larger area then that’s the time to graduate them to full family bath status. 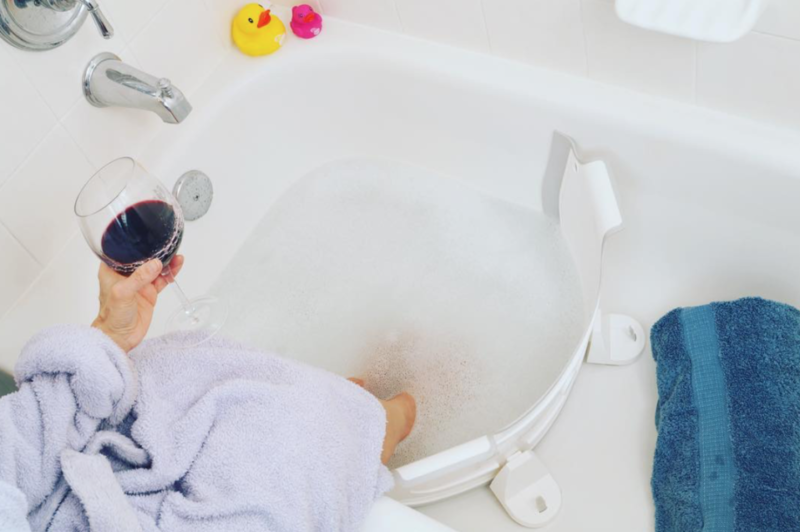 Don’t feel that BabyDam is redundant after your baby no longer baths with it, think mama foot spas with it – thank us later! If you have any other burning questions about the BabyDam please get in touch with us and we’ll get back to you as soon as we can. But if not, we’ll see you next month with another FAQ.